Admin role is required to invite more users to the project or to modify billing information. Admins can perform all available operations for projects and services. Each project must always have at least one Admin user. 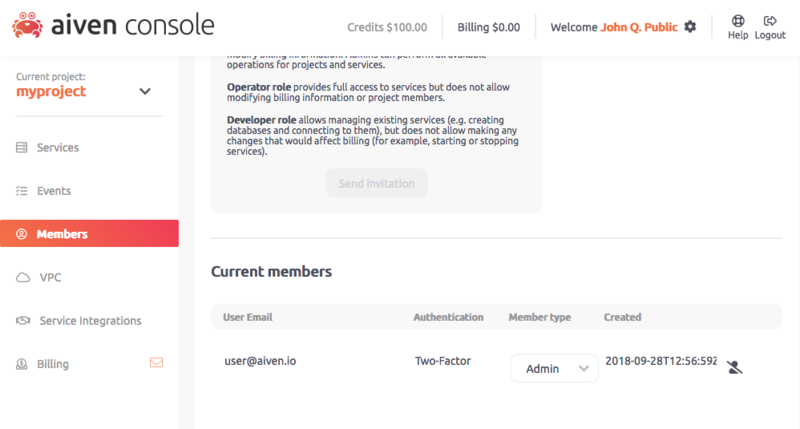 Operator role provides full access to services but does not allow modifying billing information or project members. Developer role allows managing existing services (e.g. creating databases and connecting to them), but does not allow making any changes that would affect billing (for example, starting or stopping services). Billing contact is the project member whose credit card is used to pay for the project; the billing contact can not be removed from the project.